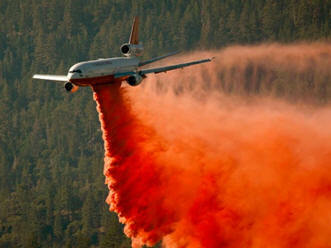 August 21, 2012 - With over 60 fires scorching more than a dozen States in the Western US, aerial firefighters are experiencing maximum aircraft and crew utilization for the first time in years, according to industry operators. “Everyone we talk to says that he can't remember a fire season as bad as this one in the Northwestern US at least since 2000,” says Stuart Taft, Chief Pilot, for Hillcrest Aircraft Company of Lewiston, Idaho. Currently, Hillcrest Aircraft Company has 10 helicopters working fires throughout the Pacific Northwest, including one in Oregon on standby for initial attack. The company deploys a fleet of Bell 205s, used to drop water or fire retardant; as well as Bell 407s and Bell 206Ls, used mostly for water drops from external buckets. According to Taft, the company's pilots are approaching the maximum number of hours they can fly under US Forest Service (USFS) regulations which stipulate no more than 36 hours in any six day period. “In past years, this has not been an issue,” he says. Small fires, sparked by lightning strikes, have also kept Intermountain Helicopter, Inc. “noticeably busier this season,” says Pete Gookin, Chief Pilot of the Sonora, California, company. “The ground is much drier than in past years, and the air is much hotter and drier. That makes for a lot of fuel,” he says. The operator's Bell 212-HP has been working out of White Cloud near the Tahoe National Forest for the past six weeks, averaging four to five hours of daily flying, anywhere from four to seven days per week, Taft notes. Along with dropping water from an external bucket, the helicopter is also being used to ferry firefighting crews and equipment to the fire lines. Mike Rotonda, Aerial Firefighting Manager for Erickson Air-Crane reports that nine of its S-64 heavy lift helicopters are engaged in firefighting throughout the Western US under USFS contracts. Another two of the Central Point, Oregon-based company's helicopters are on standby with the fire departments of the City of Los Angeles, and Los Angeles County. In fact, that includes Alaska, where Rogers Helicopters has a Bell 212 working a fire, according to company Vice President Robin Rogers. Other aircraft operated by the Fresno, California, company two Bell 212s on fires in California, and another two working fires in Montana and Idaho. As Sweet points out, to support the helicopters in the field, the company has had to “double staff” its fuel and maintenance equipment vehicles, in order to reach the far flung locations where the company is operating--faster--as well as to comply with USFS mandated rest periods. Construction Helicopters has been in a continuous firefighting mode since May 15, according to Larry Kelley, manager of the Boise, Idaho-based company's West Coast Operations. He calls this year's fire season its busiest since 2007, with helicopters currently deployed in California, Idaho, Colorado and Utah on exclusive use USFS contracts. “Just this month, we have flown over 300 hours from a base in Ogden, Utah--alone--and over 250 hours from other bases” Kelley says. “In other years, it would have been about 150 hours.” He adds that the company is approaching nearly 100 days straight on fires in locations, flying seven to hours per day--about twice the number in more normal years. “The extraordinary challenges of this year's fire season have, once again, shown that the private operators of helicopters and fixed wing air tankers were well-prepared for any contingency, including greater utilization of equipment and people,” says Tom Eversole, Executive Director of the American Helicopter Services and Aerial Firefighting Association (AHSAFA).